The DNA-510 Digital Mass Notification Announcer is capable of providing up to 2 minutes of digitally recorded voice emergency instructions and alert tones over your existing paging system. The DNA-510 connects to a phone line, analog phone system station or a phone system’s unused trunk / line input allowing you to securely page, trigger emergency messages and / or alert tones, and program the unit from any remote touch tone phone. When activated, the DNA-510 will interrupt any current paging or background music and inject an emergency voice message and / or alert tone over your paging system. A live page can also be announced. The DNA-510 can be programmed to repeat one up to 2 minute message, two up to 1 minute messages, three up to 40 second messages, four up to 30 second messages or five up to 24 second messages. 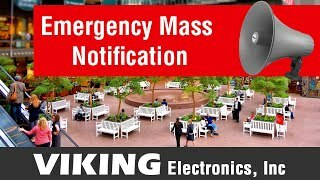 It can also be programmed with 10 different alert tones for emergency mass notification of: evacuation, lock down, severe weather, fire, bomb threat, hazardous material release, tornado, flash flood, terrorist alert, all-clear, etc. *Note: Looping recordings of actual emergency sirens and alarm bell. SPDT trigger output contacts for activating flashing beacon (BLK-4-EWP), Alarm Dialer (K-202-DVA), etc.